EOPPEP is the National Organisation for the Certification of Qualifications and Vocational Guidance, an all-encompassing statutory body investing on better quality and more efficient & reliable lifelong learning services in Greece. EOPPEP operates under the supervision of the Minister of Education & Religious Affairs, Culture & Sports and is seated in Athens. It has derived from the amalgamation of three national bodies, all under the supervision of the same Ministry: the National Centre for the Accreditation of Lifelong Learning Providers (EKEPIS), the National Organisation for the Certification of Qualifications (EOPP) & the National Centre for Vocational Guidance (EKEP). 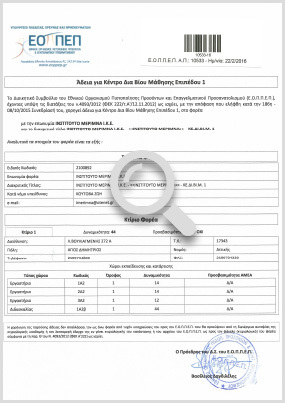 EOPPEP is one of the first organizations of the broad public sector in Greece Certified for Excellence, according to the internationally recognised EFQM Excellence Model (The European Foundation of Quality Management). In particular, EOPPEP has been certified for the 1st Level of EFQM Committed to Excellence recognition.